A liquid crystal display, or LCD, is an electronic visual display that utilizes the light modulating characteristics of liquid crystals. LCDs are typically used to demonstrate fixed or arbitrary images with little information content. These images are comprised of a great number of small pixels, compared to other displays that often have larger or greater elements. LCDs are employed for a variety of operations and functions, including medical applications, aircraft cockpit displays, and computer monitors, among many more. Liquid crystal displays have succeeded cathode ray tube (CRT) displays in almost all applications, rendering the latter obsolete. Liquid crystal display screens are also much more energy efficient and offer a safer disposal process than those of CRTs. Liquid crystal displays provide consumers with a range of veritable benefits. Defined by their agile and compact composition, LCDs offer no geometric distortion and provide clear, sharp images free of bleeding (when operated at native resolution). Additionally, LCDs do not require a great deal of power to function, so their consumption of energy is limited. Because of this, only a small amount of heat is emitted during its operation. Because of their high-quality display and unparalleled efficiency, LCD displays are ideal for use within the medical field. At ICP America, we are proud suppliers of Medical Grade LCD Displays and Medical Panel PCs. Our Medical Grade LCD Displays include MMD-2213M, MMD-4300C, and MMD-2213CH, among many more varieties. Panel PCs are often accompanied by an LCD, and are assimilated into the same enclosure as a computer's motherboard and additional electronic parts. They typically offer touch screens for convenient user interaction, and are commonly panel-mounted. 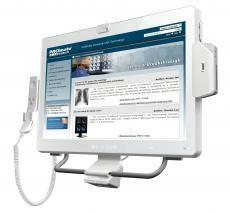 At ICP America, Inc, we offer high caliber, Medical Grade LCD Displays and Medical Panel PCs. Our LCD displays offer high brightness and high resolution monitors, and provide exact DICOM calibration. Additionally, they provide excellent display images, ideal for optimal image fusion displays and 3D color rendering. Our LCD displays are offered in a wide variety of models and styles, and are equipped with monochrome LCD monitors, varying color displays, and calibration kits. Their smart OSDs offer user-friendly and simple monitor control, and their intelligent display modes offer convenient auto adjustment. Like our high quality Medical Grade LCD Displays, our Medical Panel PCs also offer a wide range of exemplary benefits for the medical industry. At ICP America, we offer a complete line of medical grade PC solutions made for patient care. These POC-W22A-H81 screens are equipped with 2M cameras, projected capacitive touchscreens, microphones, and support iRIS-2400. ICP America has maintained its status as one of America's premiere computer innovative designers for over 25 years. We provide our customers with the computer solutions they need to make simple modifications to standard products. Because of their efficiency, intelligent features, and convenience, our LCD displays and panel PCs are able to offer the medical industry the features and results they need for success. For more information on our Medical Grade LCD Displays or Medical Panel PCs, please refer to our catalog, or contact us today.